If you have ever been a bridesmaid, you know the cost that comes along with the great honor. You also know that you love your friend so much that you will wear whatever she picks for you with a smile on your face…even if you hate the dress and know it will soon be taking up precious closet space. Being in a wedding is expensive, but it doesn’t have to break the bank. 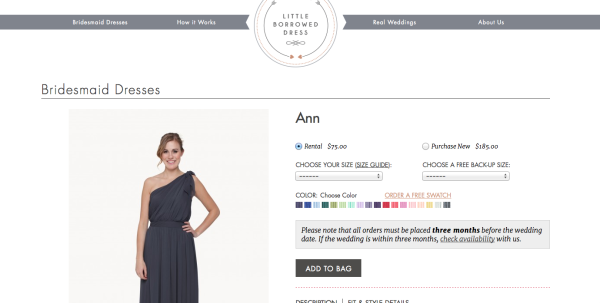 Little Borrowed Dress (http://www.littleborroweddress.com) has a solution for you and your bride friend. You can rent a bridesmaids dress and guess what.. since you rented it, you can sent it back afterwards and won’t have a dress you’ll most likely never wear again taking up space. The dresses are LESS THAN HALF the price of buying one new. Want to know what else they do that is totally awesome and a life saver?! They send you a second dress in a different size, just in case. The dresses start at an amazing reasonable price of $50.00. This just keeps getting better and better huh?! Brides, they make it easy for you as well. Little Borrowed Dress will send you fabric swatches to choose the perfect colors. You will be happy because your girls will be draped in gorgeous gowns, in gorgeous fabrics, in gorgeous colors. Your bridesmaids will be happy because they aren’t broke. It’s a win-win!